Google just released its brand new Mobile algorithm update (aka Mobilegeddon). Search Engine Marketing (both SEO & Pay­Per­Click advertising) is constantly in a state of flux. 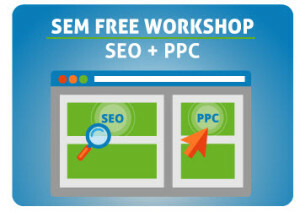 Happy to announce a FREE half ­day Search Engine Marketing Workshop where you will get a chance to learn about latest SEO and PPC techniques. P.S. : Due to platform limitations, there is a 1,000 seat limit. Sign­up now and save your seat. P.P.S: Everyone will also receive a recording and tons of other free resources in case you miss it. But you must register! everyone that signs up. Sign­up before 1,000 seat limit is reached! Hope you sign­up and take advantage of this free workshop event. Not to be missed!